In this paper we seek to eliminate the noise caused by caustic paths during progressive Monte Carlo path tracing. We employ a filtering strategy over path space, handling each subspace using specialised derivations of path tracing and progressive photon mapping. Evaluating diffuse paths with path tracing allows the use of sample strati cation over both pixels and the image as a whole, whilst sharp detailed caustics are produced using progressive photon mapping. This is an efficient, low noise progressive algorithm with vanishing bias combining the advantages of both Monte Carlo methods, and particle tracing. Ian C. Doidge, Mark W. Jones and Ben Mora. 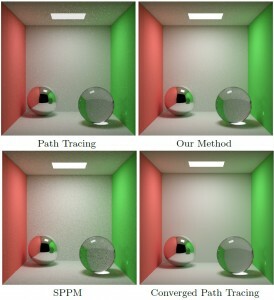 This entry was posted in Publication and tagged Journal paper, Path Tracing, Photon Mapping on June 1, 2012 by Mark.